Lectures from the middle of Campbell’s career, starting just after the moon landing in 1969 and counting to the late 1970s. 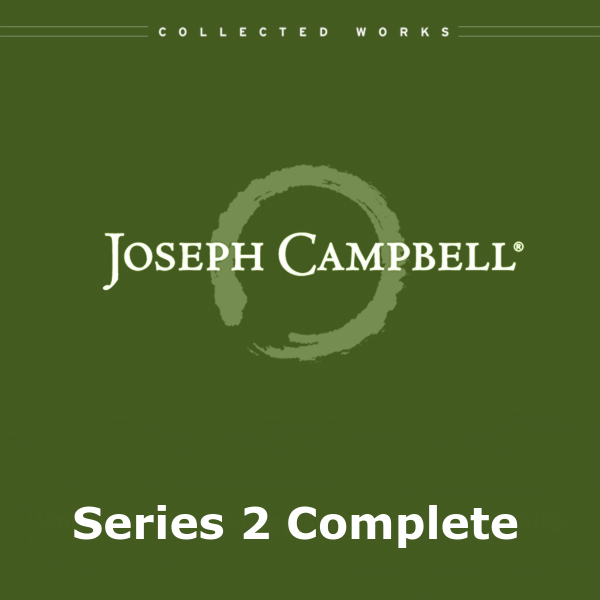 Series II consists of six volumes, each with between five and eleven audio lectures (at about 60 minutes each). New! Series II is now available as a megabundle! In Series II.1 Joseph Campbell provides a “brief history of World Mythology” by introducing us to the functions of Mythology and how the functions differ from East to West. Lectures include an interpretation of the sound of AUM, how Buddhism works in China, Jung, Thomas Mann, James Joyce, Grail Mythology, the relationship of schizophrenia and shamanism to the Hero Journey, and other topics. This tour de force is Joseph at his best. Unique among the volumes in the Joseph Campbell Audio Collection, this collection includes eleven separate recordings from a single week-long workshop — all recorded at the renowned Esalen Institute in Big Sur, California. “A Brief History of World Mythology” provides over twelve hours of Campbell covering his subject as no one else could. 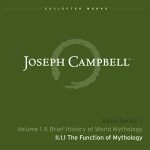 Joseph Campbell provides a detailed explanation of the four traditional functions of mythology. He shows how myths put us in touch with the richest dimensions of our lives, even as our inclination to interpret them literally -- that is, as scientific or historical facts -- disconnects us from their true power. Campbell then argues that, if myths are to continue to fulfill their vital functions in our modern world, they must continually transform, evolve even as the world does; for our older mythologies, untransformed, simply do not address the realities of contemporary life. "'Tat Tvam Asi'. You are it. That mystery which you seek to know, which you look for outside, which you project into personifications such as Yahweh, is your own very being, and looking for it out there you are losing it because you are committing yourself to a notion of relationship, of dualities, of entities which absolutely obscures the mystery." Joseph Campbell explores the ways in which Eastern and Western thought overlap, and the ways in which they diverge. All of these possibilities are before you. And then... when you come down finally to the last, you are born. And this little thing comes into the world, ignorant of all that it has experienced. It has been through the spheres of the gods and the light. And it comes out in darkness: the darkness and avidity... of the first chakra. By telling the tale of the ascent of the kuṇḍalinī serpent through the seven cakras or wheels of the spirit-body, Joseph Campbell explores the world of Tantra in its many forms—from the Bhagavad Gīta to the Bardo Thodol (the so-called Tibetan Book of the Dead) to Sukhavātī, the Western Paradise of the Amida Buddha, Campbell leads us on a hero journey through the heavens and hells of this great spiritual tradition. 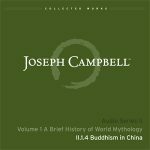 In this talk, Joseph Campbell continues his exploration of the world's great mythological traditions by exploring the mythologies of China, starting with the indigenous traditions, Confucianism and Taoism, and then continuing to discuss the way in which China's particular mythic culture took in the Indian tradition of Buddhism and transmuted it into something new and uniquely East Asian. 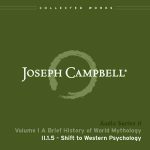 In this talk, Joseph Campbell begins looking at the psychological underpinnings of myth, and the way in which the modern revolution in psychiatric knowledge led by Freud and Jung has altered our view of the world, and of ourselves. In this talk, Joseph Campbell explores the connection between mythology and the depth psychology of Carl Jung. In this talk, Joseph Campbell explores the mythologically inflected novels of Thomas Mann and James Joyce. This series was recorded at the Esalen Institute in Big Sur, California during the summer of 1969, immediately following the Apollo 11 landing on the moon. In this talk, Joseph Campbell explores the Arthurian tales of the Grail--both in their humanist form, featuring the quest of the unsophisticated Sir Parzival, and in their spiritual form, featuring the quest of the unearthly Sir Galahad. This series was recorded at the Esalen Institute in Big Sur, California during the summer of 1969, immediately following the Apollo 11 landing on the moon. In this talk, Joseph Campbell explores way in which myth expressed itself in the earliest human cultures. In this talk, Joseph Campbell explores way in which myth expressed itself in the first cities, in classical India and East Asia, and in the birth of our modern world. In this talk, never before commercially released, Joseph Campbell sums up the subject that he has been exploring: a brief history of world mythology. He then moves on to discussing with his audience the ways in which myth and modern culture will affect each other. Creative mythology, then, is the rendition of images, of life, of poetic statements, of the orders that you perceive underlying the purposes of the world in terms of your experience. 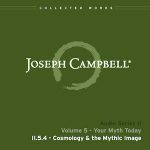 In this talk, never before commercially released, Joseph Campbell looks at what it means to having a living mythology — one that performs all of myth's functions for the individual and for society. In particular, he looks at our modern dilemma, trying to reconcile ancient myth with modern science, and points to what he calls creative mythology as the only possible response. This lecture was recorded at the University of New Hampshire on November 30, 1967, as he was writing the book Masks of God: Creative Mythology. Hermes is the lord of the road to rebirth. He is the one who meets the soul at death and guides the path to eternal life of one kind or another. In that way, he is the lord also of roads, the protector of travelers. These are his hitherworld functions. Have you ever dreamt about water? About cruising or taking a voyage? 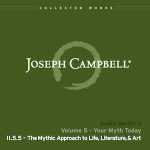 By pulling together three ideas (the god Hermes, the concept of Alchemy and the story of Odysseus,) Joseph Campbell takes us on a mythic voyage across the oceans of our mind. Listen to Odysseus’ Soul Journey and come hear of the Cyclops Polyphemus and to top it all off, Joe offers it all in modern psychological imagery by explaining Thomas Mann’s Hermetic pedagogy. This lecture was recorded at the Esalen Institute in Big Sur, California in 1968. Each one brings the myth right out of himself. And what the analyst does is help you recognize it as the image carrier of your own affects, your own energies. 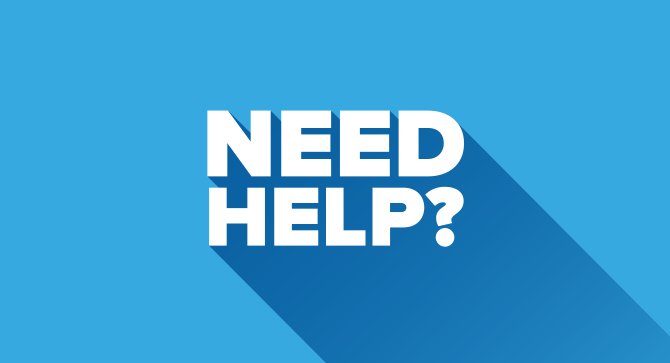 The value of the psychiatrist is that he helps you to relate your own images to your own affects, to your own energy system. And the reason you're in trouble is that you don't realize this. Michael Murphy of the Esalen Institute brought together psychiatrist John Weir Perry and renowned mythologist Joseph Campbell for this explosion of ideas. As the talk begins, Perry has already laid out his view of the progress of schizophrenic psychosis. Campbell proceeds to how Weir Perry's the experiences of Weir Perry's patients show their progress — or failure — along the Hero's Journey: the path that he himself had explored in relation to myth and dream in his 1949 masterpiece The Hero with a Thousand Faces. Campbell explains that he had never had any interest in schizophrenics for himself, but that “I didn’t know that my friends were of that order.” This lecture is humorous, informative, thought-provoking, and illuminating. Not to be missed! This lecture, to which Campbell referred often in his later work, was recorded at an Esalen Institute event in San Francisco, California in 1968. Whereas in the ancient world one could speak of two mythologies -- the mythology of the people staying in the village, doing as they were told, guarded by the village compound and the village gods, and the mythology of those who ventured into the forest of adventure for individual hero experiences -- today we can speak of only one mythology because there is no village compound. The tide has broken in. In this talk, Joseph Campbell looks at the ways in which mythologies must adapt to maintain their relevance in a world far removed from the ancient times in which they were born. Looking at how some of the functions of myth have been taken on by different segments of society, he explores the fractured spiritual landscape of the modern world, and the ways in which to heal those fractures. This lecture was recorded at Syracuse University in Syracuse, New York in 1968. It is impossible to communicate an experience to someone who has not had the experience. Try to communicate the experience of skiing down a wonderful mountain slope to someone who has never been on skis. Try to communicate the experience of being in love when it happens to people who have never known this experience. It cannot be done. You can speak only by analogy. For a system of mythological symbols to work it must be operating in the field of a community of people who have essentially analogous experiences otherwise nothing is happening there. Joseph Campbell was often asked how a new mythology was going to develop. His answer was that it would have to come from poets, artists, and filmmakers. In this talk, Campbell explores what he called creative mythology — the way in which artists can and do give a sense of the transcendent in a universe apparently empty of meaning. This lecture was recorded at Beloit College in Beloit, Wisconsin in 1969. Beginning with the symbols of the Christian faith, Campbell explores medieval history from the perspective of Tarot deck. Discussions of mythic images, mythic goddess, and alienation and rapture offer a deep look into Campbell’s unique view of such topics. Why do we yearn? What is it we yearn for? It's for something that was never on land or sea. And this is a peculiar European romantic thing. And that is the fulfillment of this special intelligible potentiality which is our own being and character. In this talk, Joseph Campbell looks at the mythic underpinnings of one of the world's great mythic traditions: Christianity. He explores the religion's historical and mythological roots, and discusses why it is that churches are struggling to keep their faith truly alive. This lecture was recorded at Trinity Presbyterian Church in 1971. The wheel of fortune is usually represented as a revolving wheel with a person up here in victory, in triumph. A person here on the way down, the depression, the crackup, the falling stock market. The person down here in the abyss. The person here on the way up. These are the four situations of fortune. Falling fortune, the abyss, rising fortune, and triumph. You are not to identify yourself with your fortune. You must know the center. And this is usually held by a goddess, the goddess Fortuna who is the same as Lakśmi, the goddess of fortune that supports the kings in India. Here Joseph Campbell delves into the mythological symbolism of the traditional tarot deck. After showing that the four suits of the minor arcana correspond to the four classes of traditional society, he goes on to unlock the spiritual significance of the cards of the major arcana, showing that, in fact, they represent an initiation into ancient spiritual lessons. This lecture was recorded at the Esalen Institute in Big Sur, California in 1971 and 1975. These are the principal archetypes, I would say, in the Jungian psychological opus: the center; the figures representing the functions -- sensation, thinking, and so forth; the personae, these are culturally conditioned; the anima/animus, also very strongly culturally conditioned; the ego, the center of consciousness; the shadow, the threat, the Freudian personal unconscious which is a function of your own biography and then the problem of the interaction of these. Joseph Campbell delves into the compelling psychology of Carl Jung, including how psychological functions manifest, both consciously and unconsciously, in individual experience. This lecture was recorded at the Mann Ranch in Ukiah, California in 1972. All I can tell you about mythology is what men have said and men experience. And now women have to tell us from their point of view what the possibilities of the feminine future are. And it is a future. It's as though the lift-off had taken place. It really has. There's no doubt about it. In this lecture centered on the feminine, Joseph Campbell presents the many roles that the Goddess has played in different mythologies through the millennia. This lecture was recorded at Sarah Lawrence College in Bronxville, NY in 1972. Whether there is a God, whether one can be united with God, whether one can transcend God, and all that, it's a perfect matter simply of vocabulary. And since the ultimate mystery of being transcends all oppositions, it also transcends the opposition of mystery of "there is a God" and "there isn't a God." So no matter how you're thinking about it, just remember you're thinking about something that can't be thought about. Joseph Campbell examines the concept of duality and its expression in Christianity, as compared to Kundalini yoga, psychology, and psychedelic experiences. This lecture was recorded at an Esalen Institute workshop in New York, NY in 1971. In Volume 4, Campbell delves deep into the relationships involving Sigmund Freud, Carl Jung, and the concepts involved in Kundalini Yoga. His thoughts on aesthetic realization, Dante’s “La Vita Nuova” and his thoughts about women as the goddess, the universe. Whether it’s Yoga in relation to modern psychology or the chakras of transformation, he is unparalleled in his clear concise blending of these ideas. In the last lectures of this Volume, he relates the archetypes to mythology and closes out by offering a detailed look at the four aims of Indian life. In part 1 of this 3 part lecture, Joseph Campbell brings together the fundamentals of Kundalini Yoga and modern depth psychologists. He lays the foundation of the chakras and other major eastern perspectives before delving into western perspectives in part 2. In part 2 of this 3 part lecture on western psychology and Kundalini Yoga, Campbell starts below chakra four and contrast the yoga perspective with perspectives from Freud and Jung. He covers relations with your mother and the powerful difference between boys and girls. 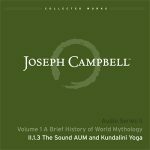 In the final lecture dealing with Freud Jung and Kundalini Yoga, Joseph Campbell explains the functions of mythology as they relate to traditional mythology. And ties it together with the explanation of AUM. This is the culmination of eastern yoga as it meets western psychology. 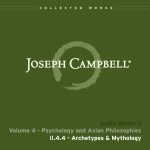 Carl Jung gave us a modern concept of archetypes and mythology but it is Joseph Campbell work that explains and inter-relates the two ideas together. From the heavenly realms, through the Tibetan karmic winds and Lord of Judgment, Joe walks us towards a rebirth and blend of psychology with Asian philosophies. This lecture was recorded at the Mann Ranch, Ukiah, CA in 1972. This lecture was recorded at the Asia Society in New York, NY in 1968. The ever changing story of mythology is brought to us with a modern perspective by Joesph Campbell. In this volume, he talks of mythology of today, his thoughts on how it relates to violence in America. Whether it’s life, literature, art or “The Way of Beauty” you don’t want to miss his 20th century perspective on the ageless story of man! Campbell explains how "Man" is viewed as the giver of meanings, the source of all the gods and all the hells, and is that One who must be recognized today, in love, as the sign to yourself of your transcendence of your own secondary ego. He takes us through the interior life of humans today and relates that to primitive myths, mysticism, and, more recently, flights in space. This lecture was recorded at the Blaisdell Institute - Claremont Colleges in 1975. As the debate rages about what to do with the violence in America that ranges from guns to terrorism, domestic violence to child abuse, Joseph Campbell compares various cultural stages, offers different view points, and shares his views on mythic thinking in this world. He also discusses recent travels through Switzerland, Italy, Germany and France, comparing those cultures with his life in New York City. This lecture offers the viewpoint of androgyny being incorporated in people's bodies by artificial means. While Campbell walks us through the concept as covered by art through the centuries, his description of various slides (not included) paint vivid images in our minds. Be it Kali (the black one), artifacts excavated in Catal Huyuk, or images from the mystery religions appearing on the Pietroasa bowl, you'll be one in spirit at the end of this lecture. This lecture was recorded at the Jung Institute (New York) in 1980. How do you talk about the universe, the big bang of creation, light years, archetypes, mythology, and the heliocentric universe in one lecture? Campbell pulls from many sources and blends them into a wonderful telling of a view of the universe, then ends with a story of Indra Purana, much to the audience's delight. This lecture was recorded at the Jung Institute - San Francisco in 1983. From the sun, moon, stars and earth, mankind tries to give meaning to life through literature and art. Joseph Campbell brings these topics into focus by describing mystical functions and attitudes, then sharing Dantes view, the love of a troubadour, and a story of Parzival and the wounded king, and how these relate to fulfilling your "intelligible character." This is a lecture not to be missed! This lecture was recorded at the Kent State University in 1975. Joseph Campbell describes how "The Way of Beauty" is approached via the aesthetic experience. Perhaps it's India art, or the way of Yoga, or Thomas Mann and James Joyce who peak your curiosity about "the Way of the Artist." No matter what your experience or approach, youâ€™ll enjoy Campbell's closing recitation of "Natural Beauty," by poet Robinson Jeffers. Joseph Campbell presents mythic ideas and concepts with a unique perspective of modern cultures. As he discusses art and it’s relationship to mythology today, he explores the confrontation of religion and society and addresses the concept of “The Psychological Basis of Freedom.” These lectures continue to illuminate and enlighten us as we move forward in the 21st century. Myths do a number of things for us - from social and cultural to psychological and spiritual. Joseph Campbell offers a modern perspective on the Illumination of myths. After delving into the perspectives of Jung and Freud, Joe ties these ideas to the modern works of James Joyce and Thomas Mann, showing how the human psyche gives shape to the Hero's Journey as illustrated in these novelists' masterworks. "I take the little myth of Santa Claus as an extremely eloquent example. The child must think of Santa Claus in a certain way. It's daddy however. And one fine day that child has to become Santa Claus and put on the whiskers and be daddy with the sentiments and the parental spirit of sympathy and playful loving accord that that image represents. And it’s a bit this way my dear friends with the rather crude images of God and so forth that are presented to our children." Speaking at Bennett College in Greensboro NC, Joseph Campbell addresses the psychological perspective of freedom as it relates to Modern Man. He touches on Roman perspectives and the “Tree of Enlightenment” and once again reminds us of the importance of acting out of our center. Joseph Campbell explores the Grail Legend and the cosmological function of mythology, offering us a unique perspective on “Mythology Today”. Listen as he describes the Levantine forms that collided with Europe and how that takes us to the three ages of spirit. This is Campbell doing what he does best! Campbell looks at what happens when you mix religion and society. He begins by looking at the recognition of the divine, and brings us to a conclusion of the affirmation of life. How? Listen as Joe offers his thoughts on the troubadour tradition, the role of an individual and scientific advancements. In this unique lecture Joseph Campbell speaks about “proper and improper art” following a dance presentation by his wife, Jean Erdman. His commentary on mythology and art covers an eastern perspective of art and how that relates to mythology of today. NOTE: We’re in the process of updating our Works Database. Please forgive us if something goes wonky. The dust should be settling by the end of this week. Do not delete this. If you do, you will be eaten by dragons. Joseph Campbell Foundation is a US registered 501c(3) not-for-profit corporation (Federal Tax I.D. #99-0285097); contributions should be fully tax-deductible. Please consult your tax professional regarding deductibility.